Washington’s Kelsey Plum is fouled. Photo by Percy Anderson. 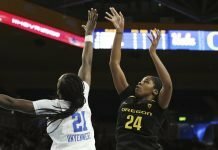 Los Angeles, Calif. – Jordin Canada’s free throws in the waning seconds of the fourth quarter lifted No. 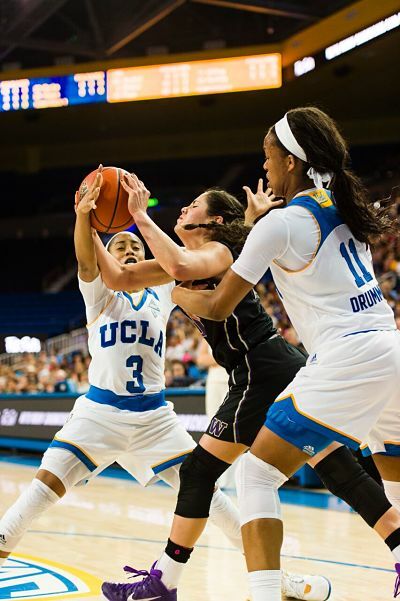 14 UCLA past upset-minded Washington, 63-59. 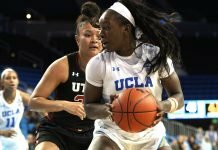 Canada lead three Bruins in double figures with 16 points, 7 rebounds and 9 assists, while Monique Billings and Nirra Fields each added 13. Kelsey Plum posted 32 points for the Huskies, to along with Talia Walton’s 19 points and Chantel Osahor’s 16 rebounds. Washington took an early lead as Plum began drilling shot after shot, and the Bruins fell behind by 17 points with just under one minute remaining. The Huskies lead 26-13 at the end of the period. The Bruins began the second quarter on a 14-4 run, cutting the lead to 3 at the 5:26 mark. The fast-paced, back-and-forth play continued, and the visitors took a 36-35 advantage into halftime. The lead changed three times in the third period, which saw each team score 12 points. 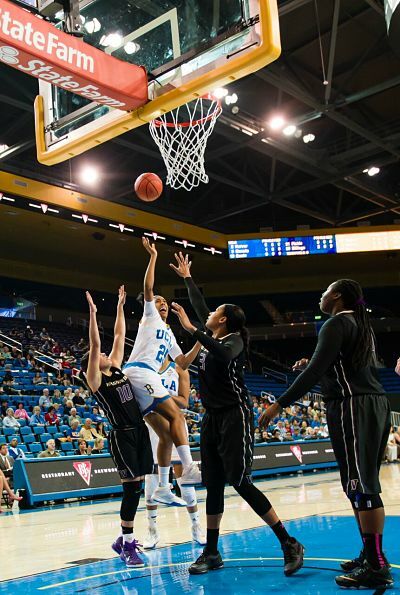 The fourth quarter began with another three lead changes, but it wasn’t until a Kennedy Burke three-pointer with 2:49 to go that gave UCLA a 59-55 lead – their biggest of the game. Both teams traded buckets and fouls for the next two-plus minutes, but Canada’s charity shots with 2 seconds remaining sealed the win. Bruin coach Cori Close was pleased with her team’s effort, but wants more. 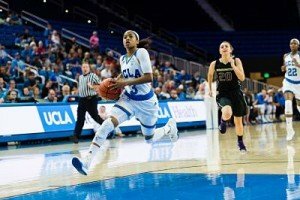 UCLA took sole possession of third place in the Pac-12 with the win. Injury-riddled Washington, who is playing seven, stands in fifth place. Coach Mike Neighbors acknowledged the Huskies’ mistakes in the game. UCLA’s Jordin Canada leads the fast break against Washington to score. Photo by Percy Anderson. Plum, who has been the Division I leading scorer for most of the season, and is now second, said having a short bench is a challenge. Close said the Bruins worked together to slow down Plum, who had 21 points in the first half. Plum said her focus is on doing what’s best for the team. One month ago, when the Bruins and Huskies met for the first time this year, it was Washington that walked away with the win. Close said Sunday’s victory is a good sign for UCLA. 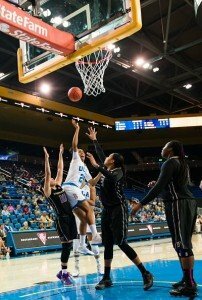 Monique Billings forces up a shot for UCLA. Photo by Percy Anderson. Neighbors said that despite the injury challenges, he sees much progress for the Huskies and is optimistic that they can receive an NCAA Tournament bid. The new finish line? Further up the road than last year’s first round exit. Kari Korver puts up a three-point shot for the Bruins. Photo by Percy Anderson. 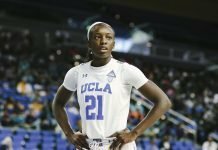 As a fan of UCLA Women’s Basketball I cannot say enough good things about Jordin Canada. She exhibits leadership on the floor, always seems to make a play, offensive or defensive, at critical times. Despite her size, she plays fearless all over the court. We have witnessed her taking complete control of a game (final game of 2015 WNIT)where she becomes unstoppable at both ends of the court. Ms. Favor’s interview now gives us insight into what a remarkable young women Jordin is.